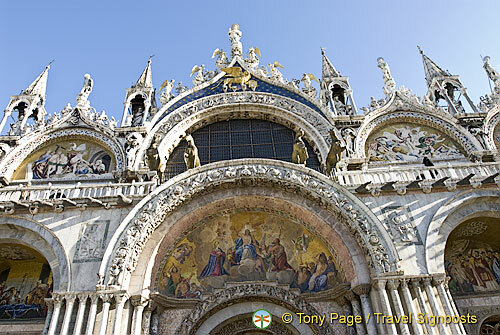 Venice is an unusual city, a mixture of influences from East and West. 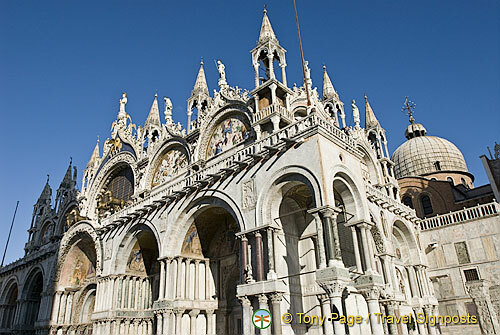 Nowhere is the East-West blend of influence more evident than in the Basilica di San Marco (St. Mark’s Basilica), the most famous of the many churches in Venice and probably the first monument that many people visit on their Venice vacation. Built on top of the burnt ruins of an earlier church, the current building took shape in the late 11th century. Consecrated in 1094, the present facade began in the 13th. The cathedral was under construction in some form or other for the next 600 years. Though the basic plan and style is Greek/Byzantine, pieces and artifacts of the church come from many places and many periods. The facade is essentially drawn from early Constantinople, lending the building its Byzantine appearance. But pillars, sculpture and much more were drawn from all over Europe and the Middle East. Five large arches support five enormous domes that provide the overall look. The best views are from the far end of St. Mark’s Square. Closer up, one can see thousands of tiny bas reliefs, such as an old man biting his hand. Legend has it that the image is of the architect, complaining that he could have built a much more beautiful church. Inside there are equally impressive features. The Byzantine mosaics, all 8,000 square meters (86,000 square feet) of them, draw fascinated visitors from all over the world. There are dozens of separate ‘stories’ that depict religious symbols and events that would have been familiar to locals of the time. The individual tiles were deliberately placed not perfectly flat, in order to splash light in all directions. Within the space there are several separate areas worthy of long and close attention. San Marco’s Treasure is a collection of gems, ceramics and objects made of precious metals that would astound even the most jaded. They were gathered from numerous countries over centuries of trade and conquest. Today there are hundreds of pieces of enamel on the high altar, named the Pala d’Oro (Golden Pala). Covered with gold leaf, it was begun in 1,000 AD and continued to be built up over the following 300 years. The result is a collection of nearly 2,000 sapphires, garnets, emeralds and precious stones to rival any other collection in the world. Also inside, in the Museo Marciano, are the original four gilded bronze Horses of St. Mark, replicas of which were installed on the front facade of the Basilica. The origin of these horses, Roman or Hellenistic, remain a mystery however it is known that these horses once graced the Hippodrome in Constantinople until they were looted by the Venetians during the Fourth Crusade. To fit them on the boats, the Venetian looters decapitated the horses. The collars that you see were added by the Venetians to cover the seam where the heads were reattached. The horses, enormous in size and each a sculptural masterpiece, were later taken by Napoleon to Paris in 1797. After his defeat they were taken back to Venice in 1815. Exposed for centuries to weather, they were finally brought inside in the 1990s and bronze replicas of these now stand on the front facade of the Basilica. Another object of note is the Tetrarchs. Made of porphyry (a type of marble) and taken from Constantinople in 1204, this sculpture sits in the southwest corner. The figures displayed are thought to represent Diocletian, Maximian, Valerian and Constance, the four co-emperors of the Roman Empire during the period of Diocletian. There are literally hundreds of small areas that merit a look in St. Mark’s Basilica and it’s impossible to cover them all in the one visit. Every little feature, sculpture and decoration in the building tells a story so no matter how often you visit, you’ll find something new to explore. But to avoid the lines, either schedule a visit in or arrive early in the morning.